Lapinette turned on a camera and the Wabbit swam into sight on the big screen. "Puppets!" he commanded. "Listen! Now you have a choice!" 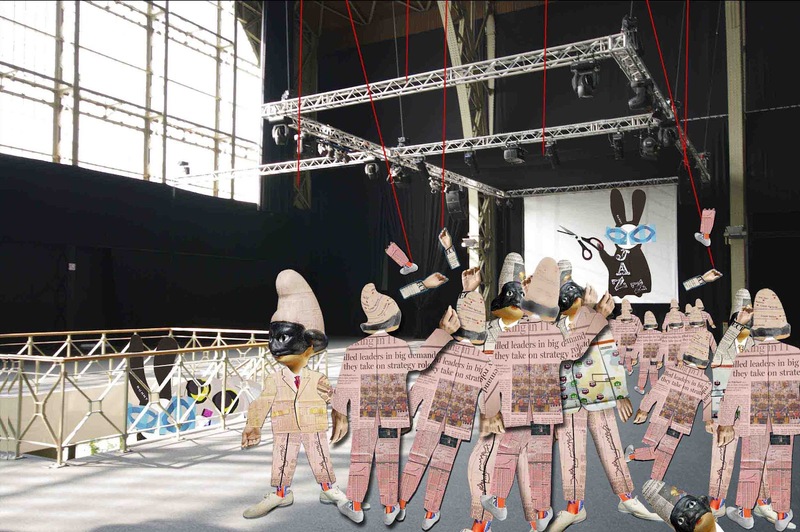 The Puppets stared at the Wabbit and they shifted uneasily. "Rise!" shouted the Wabbit. "Rise like puppets woke by thunder!" Lapinette clashed two cymbals together and everyone jumped and gave the Wabbit time to think of the next line. "In unconquerable number!" he cried. There was as snapping noise from the back of the House, followed by others. "Snap your strings like crusty glue, that day by day attached to you!" rhymed the Wabbit. A ripple passed through the puppets like a Mexican Wave. The Wabbit thought furiously. "You're solo puppets through and through!" he bellowed. No-one really knows who threw the first punch. Perhaps no one ever will. But the Wabbit thought he caught sight of Pio's jacket and a light grinned from one of his 28 teeth. The House dissolved into a flurry of puppet limbs and severed strings and all was chaos. "Lets get out of here," said Lapinette and she propelled the Wabbit down the stairs to the door. "Where on earth did you get that poem?" "I borrowed it," gasped the Wabbit, "I took it from Shelley." "Not the Masque of Anarchy?" said Lapinette. "Well, did it work?" demanded the Wabbit. "It worked," sighed Lapinette. "It always does," smiled the Wabbit.